It seems as though developers with an expertise in Microsoft Windows 7 won’t be out of a job any time soon. Although the release of Windows 8 is just around the corner, Microsoft’s current operating system (OS), Windows 7, has become the OS of choice for more than half of the world’s computers. 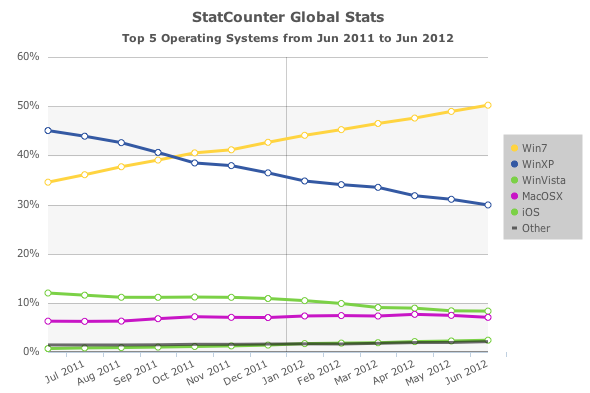 According to StatCounter, Windows 7 has made it onto 50.2 percent of the world’s computers as of June 2012, taking the top spot from XP, which stats show is now the OS for 29.9 percent of computers. This means that despite Apple’s popularity, more than 75 percent of the world is still using a Microsoft OS. However, no operating system stays on top forever. StatCounter’s data should provide incentive for developers not only to be familiar with Windows 7, but to also stay ahead of the trend by becoming Windows 8 Certified. After all, it is only a matter of time until Windows 7 is dethroned, right?